Steeroid Junior, You seem to be a bright young person with a keen interest in aviation. Thank you for the writeup, and I am sure my son will thank you for the compliment. AND this very interesting model CCW5 made by a hobbist! Last edited by Steeroid : 28th June 2015 at 00:47. That sort of changed with the Su27, didn't it? It did away with the heavy swing-wing config by making the fuselage a part of the wing area (or whatever its called technically). Interestingly the Su27 and the MiG29 were products of the same Soviet design remit for interceptor bombers, but we went in for the lighter MiGs but not the Su27s that were meant to complement it - did the Su30MKI come after the 29s or along with them? For high speeds you want swept wings and low aspect ratios and for take off and landing you want unswept wings with a high aspect ratio. For low altitude maneuvering and tight control in a ground attack mission you need moderately swept wings with moderate aspect ratios. A fast combat jet needs all three especially if it is a fighter with a secondary attack role or a attack jet with the ability to defend itself. So came in the variable geometry wing or swing wing which could be set to 2 to 4 sweep angles or as in case of the Tornado be capable of continuous sweep movement. The compromise here was that maneuverability was never top notch. The Mig-27s with the IAF are in this basket. In the 1970s and 1980s the Russians, Americans and French then worked on new designs where the wing remained fixed (and thus saved the weight of the variable sweep mechanics) but changed shape subtly through what is called variable camber where the leading edge slats and trailing edge flaps move in carefully choreographed computer controlled movements to make small changes to the shape of the wing. This was married with wing-body blending where the wing and body gradually blend into each other with no clear dividing line. 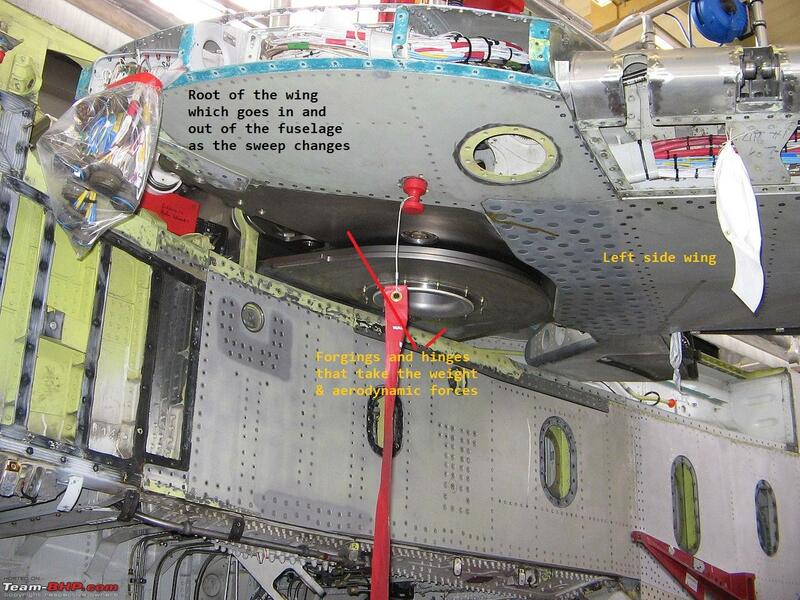 This greatly reduces drag that used to result at the point the wing abruptly met the fuselage. The blending portion also continues to act as an aerofoil thus augmenting lift. In the erstwhile USSR pure aerodynamic research was done by the an institute named TsAGI who then shared their research with Sukhoi, MiG and other design bureaus and worked with these bureaus to develop a final product. That is the reason the Mig-29 and the Su-27 or Su-30 have wings that belong to the same family of thought. The Su-27 and Mig-29 are contemporaries - being long range and short range partners much like the Americans have the F-15 and F-16. The Su-27 morphed into the next generation Su-30 which then evolved into the Indian-Russian developed Su-30MKI which is a whole jump ahead of the Su-30 even though names are similar. The next in line are the under development Su-35 and a long range bomber Su-34. In looks these machines are similar but very different under the skin. The Mig-29 enjoyed less support from the post Soviet Russian Govt as they had funds only to develop one of the two further and chose the longer range Su-27 to work on. India's large order and huge collaboration to develop the MKI version has given this redoubtable aircraft a long lease of life. The avionics of the 'MKI' version was largely developed by India with support from the Russians and incorporates Russian, French, Israeli & South African equipment mated by Indian integration software and codes. The Mig-29 was developed into the next generation Mig-29K multirole aircraft for the Indian Navy. Being smaller in size it is better suited to the size of INS Vikramaditya. So Mig-29K and Su-30MKI are roughly of the same generation. The old Mig-29s of the IAF even after some modernization are a little older in evolution and much shorter legged. Su-30MKI. The Canards are used for delaying stall, maintaining better stability in pitch, reducing take off runs and improving maneuverability. The Leading Edge Root Extensions (LERX) are used for keeping the aircraft stable at high angles of attack and contribute directly to the Su-30's remarkable maneuverability. Our MKI's also have swiveling engine exhaust nozzles that make a unusual difference to maneuverability. Thanks for another brilliant article V. Narayan. Took me back to the past for a while. I came to know of the existence of such aircraft in the early 80s only while reading a fictional novel. The novels 'Firefox' and its sequel 'Firefox Down', written by Craig Thomas, were about a NATO spy pilot trying to steal a fictional Mig 31 (equipped with mind controlled weapons) from the Soviets. In the climax, he was given chase by Russian Mig 25s which he had a tough time getting rid off. The first novel was even made into a poorly adapted movie. Sir, that is simply unmatched by anything I've read on the internet about the MiG-25. I have always been crazy about planes since I was a child and your threads are simply brilliant to read. Hats off to you for the amazing amount of information that you manage to put out here. I had the fortune as a kid to play around these gentle beasts. I even recall once when they pulled out a 7ft snake from the intakes of one of these beasts. It was summer and the poor snake found some cool refuge in there. Little known fact is that one of the Mig25 pilots once went for a recce over our neighbour, he took all the pictures and on his way back over Isloo decided to go Mach2 which caused a sonic boom over Isloo sending them in to all kinds of panic, to their credit they scrambled F16s but since the F16s have a lower service ceiling couldn't climb high or fast enough to intercept. By then news had reached the powers that be and the then AOC-in-C & SASO scrambled to issue instructions to fly back to base, the pilot had plans of doing the same over Lahore as well before reporting to Northern/Alpha but couldn't execute due to some very pissed bureaucrats, while the AOC tried hard to hide the smile on this face. Thanks, V.Narayan. It was really informative to go through your post. I've been a fan of the MiG-25 and the SR-71 ever since I read The Devil's Alternative by Frederic Forsyth, way back in the early 90s. That book has a thrilling chapter dedicated to a chase of the SR-71 by a couple of MiG-25s as part of the story. I don't know if any of you have read it, it's a very good novel. Peter Jim, Thank you for your compliments and thank you for reading the article. I will retire in a few years - practicing, my skills to keep busy in 'em golden years! You owe me a few naval questions, Peter. Yes I do sir, Apologies for the delay from my end, I shall surely put the on the famous thread. As you know several fighters have two seat conversion trainer variants. Normally the trainer variant has an instructors cockpit fitted behind the main cockpit and this eats into integral fuel cavities or gun ammo bays. In case of the MiG-25 they retained the main cockpit where it was and used the long nose to position the instructors cockpit. Unlike most fighters here the instructor sits lower front and the pupil sits upper rear. As in most fighter trainers the instructor can in an emergency fire the pupils ejector seat but the student cannot get rid of the teacher. In the bi-plane era it was common for the cockpits (typically uncovered) to be separated by a few feet like in the Tiger Moth for example. But since 1940s I know of only two conversion trainer aircraft with a similar arrangement of separate cockpits for pupil and instructor and a third which had two pilots in completely separated cockpits. So this is not because, they were never in the mainstream, this was more due to "Me not seeing them". Very happy to see those fighters trainers with seats like that of fighter choppers like Mi-35 or apaches. As I understood from the comments, you have written more such articles. Will definitely find them and go through them in this week. Absolutely terrific. You deserve my Standing Salute ! Sirji, it's F-82 - the F-86 is the renowned Sabre ! This is the original , probably first twin boom fighter - the P-38 Lightning. What about the Vampire? Did that not precede the P38? Also The F82 has 2 independent fuselages while the P38 and Vampire have a single fuselage with twin booms. What about the Vampire? Did that not precede the P38? The P-38 was a pre-WW2 design while the Vampire only just missed entering service before the war came to an end. Wow!, what a write-up. Such a comprehensive one about an aircraft few of us knew was so unique. Hats off to you Sir and please keep such articles coming. Makes a riveting and informative read. Brings back so many old memories like how I wanted to become an IAF pilot just to fly the Foxbats ! I have seen them in a dog fight over the Kumaon hills very long ago and even seen them very very closely when one of the Foxbat squadron's were based in Bareilly. Thank you for the entertaining read. I remembered Brian Schul's Sled Driver where he described the SR-71. And one funny incident narrated by Brian. Another superb article Mr. Narayan. Unlike other MIG's in IAF service which were in news for varied reason, I came to know of MIG 25 only when it was about to be decommissioned. There was an article in The Week magazine sometime in early 2000's about the bird. I am not able to find the article anywhere in Week's website, however found the same republished in another site. Faster than fairies, faster than missiles. Flying 30 km above the earth in the stratosphere at nearly 3 mach (mach is the speed of sound), there was no missile that could shoot her down. She could see everything she wanted to, without being seen. The all-seeing AWACS dreaded her, for she flew far above its reach and could shoot it on the back. She was invisible and invincible. She was MiG-25. For long, her enemies did not even know her name. They thought she was MiG-23's new version, and even wrote so in secret despatches and books. Then they nicknamed her Foxbat. Who knows, many a UFO sighting in the Californian skies could be a MiG-25, still the world's fastest (save the American SR-71, which has been grounded), the highest-flying and the least photographed aircraft ever. The finest child of Soviet cold war ingenuity, she belongs to the world of legends and aviation folklore. But now, after nearly two decades of silent service-often without a mention in the official despatch-the Indian Air Force (IAF) is bidding goodbye to MiG-25s. The spares are scarce-even her original makers do not have them. Satellite imagery is replacing her cameras, another reason for the grounding. By the time she had joined the IAF's Bareilly-based 102 squadron, in 1981, the MiG-25 had already become the world's most enigmatic plane. Flying her needed a test-pilot's skill-mere fighter pilots were no match. Back to history: NATO air attaches watching the 1967 Air Force Day ceremony at Domodedovo airport outside Moscow were intrigued by the prototype of a twin-engine fighter plane parked amid a clutch of puny MiG-21s. None of them, all experienced air force officers, had ever seen such a huge jet-fighter. With a wingspan of 43 feet, length of 71 feet, and a height of 21 feet, she could not be concealed. By evening, air intelligence officers in NATO capitals were exchanging secret notes. They did not know what sort of a plane the commies were making. They called her MiG-23 and nicknamed her Foxbat, hardly knowing that MiG-23 was just a step-sister of the famed MiG-21. For the next many years, the Foxbat flew all over the European and American stratosphere but no one got wiser about her. Another myth was born: she was powered by a modified rocket engine, or a cruise missile engine. One day in 1972, two Foxbats, piloted by Russians, took off from Egypt and flew at 2.5 mach over Sharm el Sheikh, teasing Israeli radars. The Israeli Air Force scrambled their best Phantoms, but even the radar blips were gone in no time. 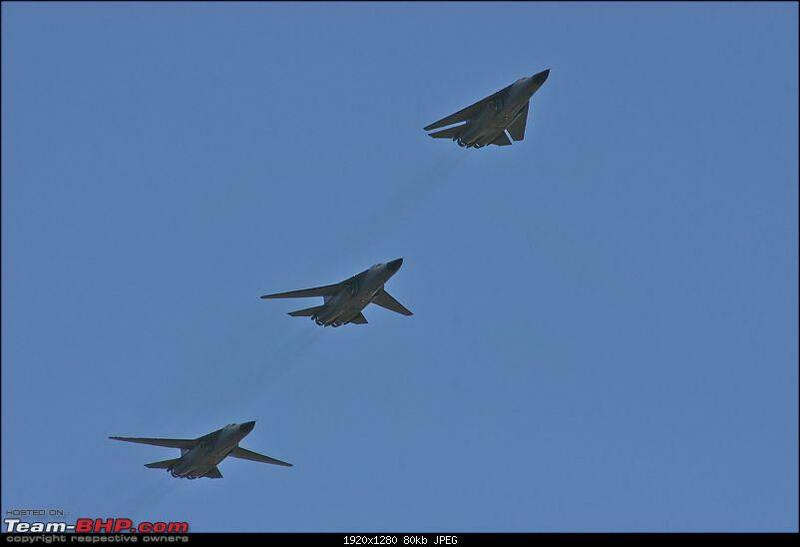 The event came to be recorded as one involving MiG-23s. 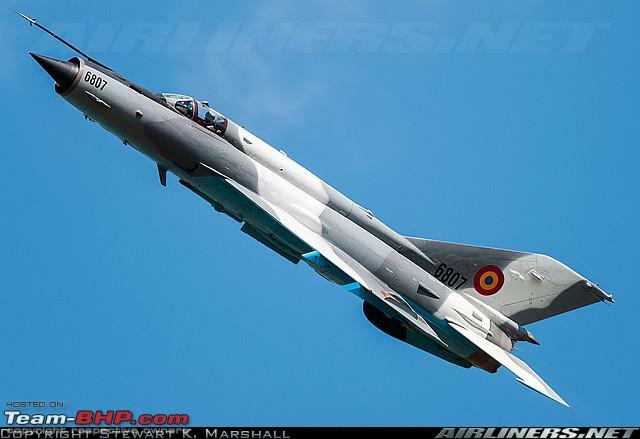 NATO commanders soon realised it was not the MiG-23 but one they had not heard of. In September 1976, they got a chance to dissect her and have a close look. Belenco told his American hosts that Soviet commanders never allowed Foxbat pilots to fly her at speeds less than 2.5 mach. NATO pilots had never seen her because she mostly flew more than 24 km above the earth. A few years later, a few Foxbats joined the IAF where men like Yuri, now a well-known radio jockey and managing director of FM radio company Green Channel, flew it. Yuri, or Wing Commander Yogesh Suri, had already been a test pilot when he was sent to fly the superplane. "We reached Bareilly dying to have a look at the plane," he said. "We, pilots of supersonic fighters, behaved like children, threw suitcases into rooms and ran out to see the legend. The first flight had to be put off due to rains. Disappointed, we went round and round the plane in sheer awe. Even the cockpit ladder amazed us. So tall!" Flying her, Yuri realised that the plane's performance exceeded the legends about it. "The sheer power of that climb into the stratosphere at mach 3! She alone could do it," he said. "And up there, we flew amid the stars. It's all black around, as in space. The cockpit walls are so high that you don't see the earth below. You feel alone, but peaceful. No other plane can give you that feeling. From Jodhpur to Adhampur, I have flown her in 30 minutes." Had luck favoured, Yuri could have been an astronaut instead of Rakesh Sharma: he was one of the four who had been trained to go to space. Foxbat pilots have only one regret: they get no combat experience. There are no dogfights, no manoeuvres, for the plane does not encounter an enemy at that speed and height. The IAF has its own Foxbat lore. In the late 1980s, the IAF reportedly sought, but was denied, Prime Minister Rajiv Gandhi's permission to fly over Islamabad. But as a serving air commander put it, "Who knows whether we flew or not? Even if we had, no one would have known." In May 1997, a deafening noise rocked Islamabad. One Indian pilot was flying over the city when he broke the sound barrier at 65,000 feet. The Pakistan Air Force (PAF) first thought of scrambling their F-16s, then thought the better of it. For, no plane could reach anywhere near a Foxbat. PAF still believes that the IAF's Foxbat pilot deliberately broke the sound barrier to rub it into PAF minds that they had nothing that could get close to a MiG-25. The MiG-25s embarrassed the US and British air forces in the 1991 Gulf war. 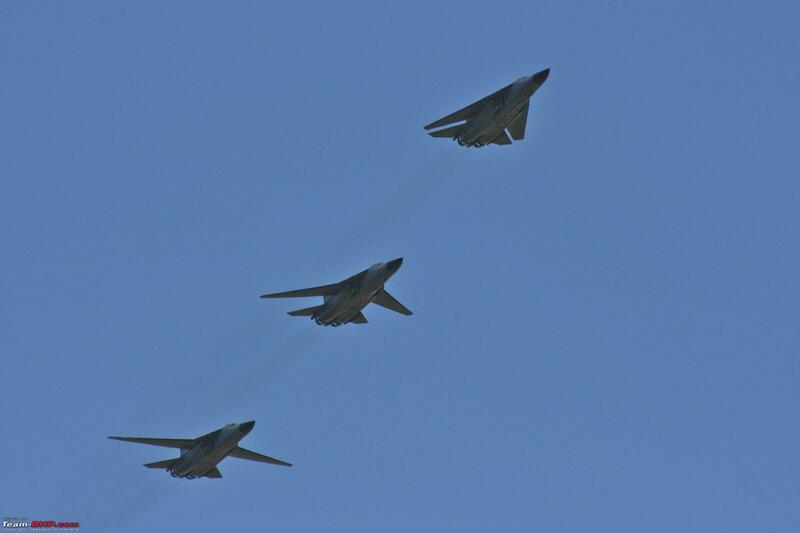 In one incident, as wave after wave of F-14s and F-15s entered Iraqi airspace, escorted by A-6 and A-7 fighters, one Iraqi Foxbat took to the air, shot down an F-18, shot a missile at an A-6 and whizzed past another. Foxbats also saved the MiG-29s, which Iraqi President Saddam Hussein sent to Iran for safekeeping before the war broke out. The MiG-29s flew to safety while a few Foxbats engaged USAF's F-15s which tried to intercept the fleeing planes. The F-15s shot more than half a dozen missiles at the Foxbats, but the latter outflew all of them. The closest look the Indian public got of her was when a Foxbat crashed near Pathankot in 1998 due to a technical defect. Now, some of the grounded aircraft may be exhibited in museums. MiG-25 may have flown into history. But her pilots will remember the sense of being invisible she gave them. Forever. 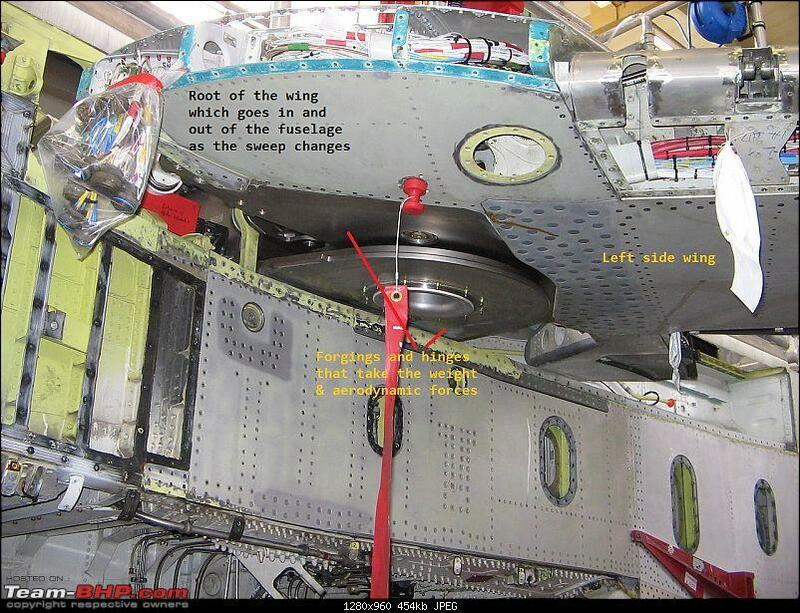 Aside from the weight, maintenance was another factor that weighed against variable geometry wings. As for strength - no better example than the F-14 Tomcat. After their retiredment, they were ordered to be destroyed so that nothing useful remained that left any chance to be smuggled to Iran, the only other country to fly F-14s. According to anecdotes, the wing-box section was the hardest to destroy. They use industrial rotary saws to chop planes up, and the F-14's wing-box is made of titanium and welded together with another radical tech from the 1970s - electron beam welding. Those things were designed to take a lot of punishment. 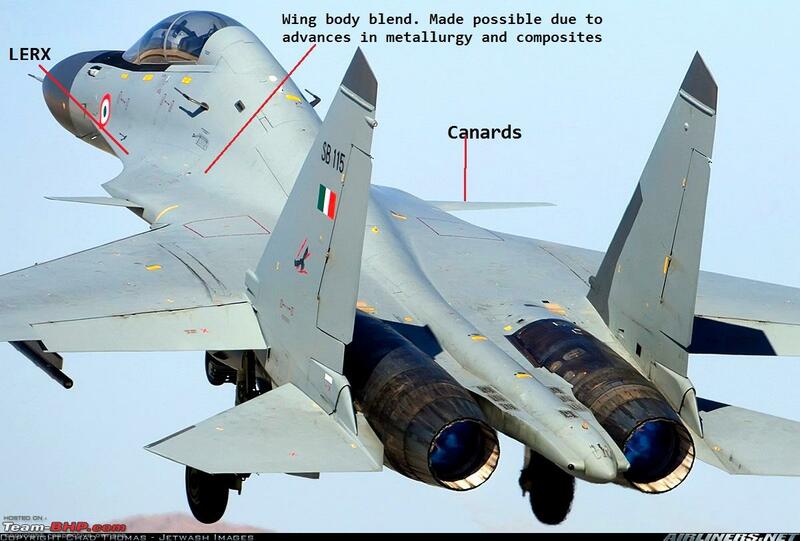 The other big reason for the Su-30 gaining canards is to counter-act the heavier radar (vs the Su-27P ) which upset the weight balance, and the two nose-wheels also put in for the same reason.